This is a follow-up to my previous post “When an infusion nurse gets an IV”. Many have asked about what “phlebitis grade 2” meant. Phlebitis is defined as the inflammation of the vein and is considered an adverse patient outcome. The Infusion Nurses Society’s infusion nursing standards of practice (2006) provides a uniform standard scale for measuring grade or severity of phlebitis. This scale is used for documenting phlebitis grade according to the most severe presenting indicator. Grade 3 – Pain at access site with erythema and/or edema, streak formation, palpable venous cord. Grade 4 – Pain at access site with erythema and/or edema, streak formation, palpable venous cord greater than 1 in in length; purulent drainage. Phlebitis rating Grade 2 or higher should be reported as an occurrence and proper intervention and treatment should be implemented per the institution’s policy. Phlebitis resulting from peripheral IV’s should be monitored and the incidence should be calculated. The acceptable peripheral IV catheter phlebitis rate is 5% or less in any given patient population. So next time you find yourselves looking at an arm with possible phlebitis, use the phlebitis scale to grade and document. In my case, my phlebitis was grade 2 as described above. It has been 5 days since and my arm is slowly recovering with just minor bruising left. While the pain, erythema and edema is gone, I will however not forget the experience I’ve had. 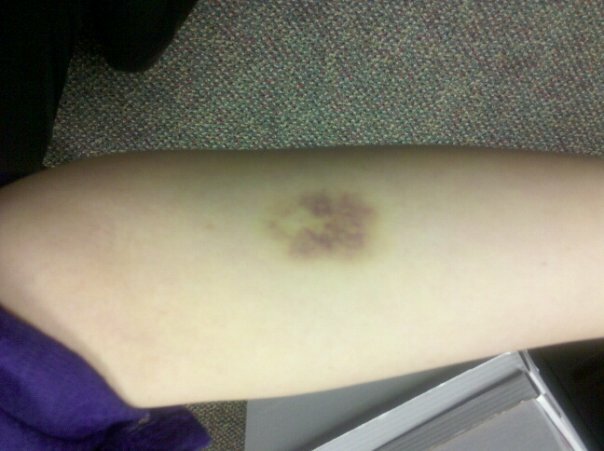 The Phlebitis Scale does mean something..
← When an infusion nurse gets an IV.